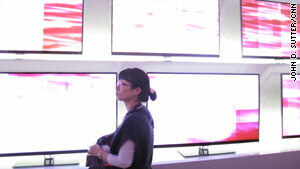 New TVs, 3-D and otherwise, proved to be bit hits at the annual technology show. Las Vegas, Nevada (CNN) -- Three-dimensional televisions, Internet-enabled TVs, touch-screen "tablet" computers, e-book readers and other fun new gadgets were scattered all over the enormous Consumer Electronics Show in Las Vegas, Nevada. CES, which ended on Sunday, is regarded as one of the best trade shows for spotting new technologies before they take off. DVDs, CD players and Blu-ray all were introduced at previous shows. It is the largest event of its kind in the world. As we hunted through thousands of tech displays at the show this year, these 10 products particularly grabbed our attention. It's hard to say which, if any, of the new technologies shown at CES this year will become a hit with consumers. But these 10 new toys proved to be useful, unique or just plain strange. So, here they are, in no particular order. Please let us know what you think. Toshiba unveiled a prototype of a television that doesn't require a remote control -- TV watchers simply wave their hands in the air to control the menu, fast-forward movies and turn the volume up or down. Many TV makers are working on "gesture" technology for TVs, and it hasn't been perfected, but Toshiba is among the first to show it off publicly. A wave of the hand controls this Toshiba CELL TV. In a demo at CES, a woman put her palm out in a "halt" position to select items from a 3-D, spherical menu on the TV screen. She looked like she was swimming the breaststroke when she commanded the TV to zoom in on an image. The TV uses infrared technology to sense a viewer's movements in a particular zone of the room, which a demonstrator referred to as the "couch-potato zone." What's cool: The idea of technology that reads human gestures has the potential to revolutionize the way we interact with computers and TVs. One of the big problems with 3-D TV is that most systems, when they debut later this year, will require viewers to wear 3-D glasses. They're goofy, expensive and, some testers complain, cause headaches and nausea. But TCL Corporation, the Chinese company that's a parent of RCA, showed off 3-D TV technology that doesn't require glasses. A company representative said the technology, which adds a layer of rippled lenses to the front of the TV screen to produce the three-dimensional effect, could be used in the home as well as on billboards. "Basically, we put the glasses that you'd be wearing on the TV," a TCL spokeswoman said. What's cool: No irritating glasses. Amid a crowd of promising new electronic readers at CES, this one stood out. This software application, built in part by futurist-inventor Ray Kurzweil, turns almost any laptop, netbook or smartphone into an image-rich, full-color electronic reader. Blio uses publishers' original PDF files to preserve the exact format of books and magazines while supporting interactive multimedia, including video and Web links. It will launch with an online store featuring more than 1.2 million titles. Best of all: It's free. Price: Did we mention it's free? Tivit catches live TV signals and brings them to smartphones. The Tivit, a cute, credit-card-sized device, catches live television signals -- like local weather and news -- and brings them to smartphones such as the iPhone, Blackberry and Droid. The gadget is an intermediary step for people waiting for mobile-TV-enabled phones, and for those who don't want to purchase a new phone just to get TV on it. Tivit, from a company called Valups, uses an antennae to pick up mobile free digital TV signals from local television stations, and transmits them to phones via Wi-Fi, which it also creates, meaning you don't have to find someone else's Internet hot-spot to get a connection. Why it's cool: Upgrade to mobile TV without getting a new phone. Plus it's sleek. How meta. Samsung unveiled at CES a television remote with its own television screen. The "All-in-One-Premium" remote, which also plays its own audio, can be tuned to different TV channels than the TV it controls. It will come with Samsung's upcoming C9000 high-definition TV, and will be sold separately, said spokesman Jermain Anderson. So, why would a person want such a thing? A Samsung spokesman said the TV-playing remote has as few functions. Say you're watching a sitcom while your roommate wants to watch a basketball game. One of you can watch on the remote, he said. The remote-watcher can put headphones on so you can both hear the audio. Chalk this one up to another big trend at CES: Digital screens are ending up everywhere. Why it's cool: It's so over-the-top unnecessary that it's a little bit interesting. Tablet computers created quite a stir at CES. These mid-sized devices fall somewhere between mobile phones and laptops in the computer continuum. Among the standout tablets at CES was Lenovo's U1 hybrid. It looks like a laptop, but its touch-sensitive screen pops off to become its own tablet. Independent from the keyboard, the screen looks like a big iPhone, and is said to be ideal for reading digital books, sorting through and resizing photos and surfing the Web. The tablet is not without issues, though. One short-circuited in a demo for CNN. Why it's cool: It's got the best of both worlds -- a take-with-you tablet for consuming media, and a keyboard for content creation. It's not a consumer product yet that we know of, but this multitouch-screen display at Intel's CES booth fascinated us and just about everyone else who saw it. Two seven-by-seven-foot HD screens showed an ever-shifting array of 576 cubes, each representing a photo, video or other piece of Internet content pulled from 20,000 sources and more than 20 live feeds. Touch a cube, and it expanded the content in real time. Why it's cool: Can you imagine your digital life arrayed like this in your home or office? Plus it just looked neat. 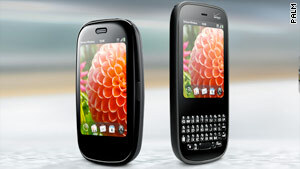 The upgraded Pre and Pixi smartphones have an app that creates a personal Wi-Fi cloud. This newly announced smartphone, along with its thinner cousin the Pixi Plus, wouldn't be a huge upgrade over the current Pre except for one novel feature: The capability to create a 3G mobile hotspot for up to five laptops or other devices. 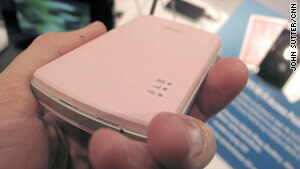 The function comes in a downloadable app that lets Pre users create a personal Wi-Fi cloud on Verizon's 3G network. Why it's cool: Wi-Fi everywhere you go, without paying Starbucks fees or buying a wireless card, sounds pretty sweet. The Intel Reader scans printed text and reads it out loud. OK, so it's an expensive niche product. And we've already given some love to Intel in this article. But this handheld device that scans printed text, converts it to voice and reads it aloud seems too groundbreaking to ignore. Hold the it over a page of a book, snap a high-res image of the text and the thing will read it aloud to you almost immediately. It also can play documents you transfer from a computer. Why it's cool: Yes, it's pricey, but this gadget could be a life-changing tool for the dyslexic or vision-impaired. It's a remote-controlled helicopter. And a gaming device. And yet another use for your iPhone. This flying toy is about the size of a pizza and can hover almost motionlessly, propelled by four rotors and an on-board computer. Users steer the Drones with iPhones, which act as remote controllers. A camera mounted on the AR.Drone sends a live video feed to the iPhone, meaning that you see what the Drone sees. Parrot is creating augmented-reality video games for the open-source device. Why it's cool: It's fun, it's different and it can hang suspended in the air like the spaceship in "District 9."